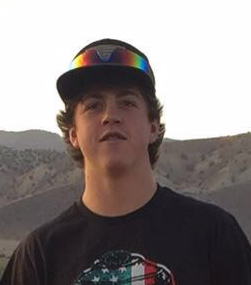 Brayden "B" John Smith, 15, of Sigurd, Utah passed away February 2, 2019. He was born May 26, 2003, in Salt Lake City, Utah to April Vada Ames and Hyrum C. Smith and Travis and Robbi Harvey. Brayden loved life and enjoyed it to the fullest. He was a hard worker and lots of fun to be around, making others laugh and always had a joke. Brayden loved the outdoors but most of all loved riding anything that had wheels. His favorite color was pink and he owned it. Brayden’s favorite sports were baseball and wrestling. Brayden was loved and he loved everybody in his family and beyond. He is survived by his parents, April Vada Ames and Hyrum C. Smith and Travis and Robbi Harvey; brothers and sisters: Tiesha Zelda Smith, Wyatt Harvey, Gavyn Harvey, Dugan Harvey, Brydger Harvey, Samantha (Edgar) Gonzalez, Justin Best, Kaysen Ames, Kyler Ames, Keaton Ames; grandparents: Ruby Smith, Richard and Dixie Smith, Cliff and Zelda Gull, Edson Crowley, Georgette Harvey, Jake and Jennifer Vandemyle; great-grandmother, Eileen Smith. Preceded in death by brother Tyson Hyrum Smith; grandfather, Terry Harvey; dad, Kevin Ames.